New York, 01.10.1852, 7 % Second Mortgage Bond über US-$ 1.000, #292, 25 x 32,8 cm, schwarz, beige, Knickfalten mit Einrissen (eine etwas gebrochen). New York, 1 October 1852, 7 % Second Mortgage Bond for US-$ 1,000, #292, 25 x 32.8 cm, black, beige, folds (one partially broken). Die Bahn wurde am 18.02.1848 gegründet. 1867 wurde die Strecke an die Cleveland & Toledo Rail Road Company verpachtet. Ein Jahr darauf firmierte das Unternehmen als Lake Shore Rail Road Company. Aus ihr entstand später die Lake Shore & Michigan Southern Railway Company. The railway was founded on 18 February 1848. 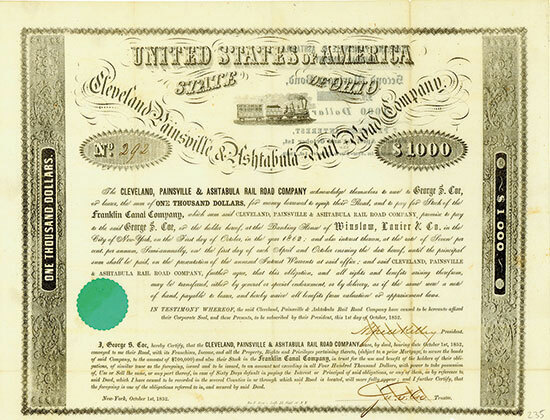 The line was leased to the Cleveland & Toledo Rail Road Company in 1867. The name was changed to Lake Shore Rail Road one year later. This company became later the Lake Shore & Michigan Southern Railway Company.